Enjoy this, my second list, of great gardening blogs to visit. The best serious and funny garden blog in the world! No more words needed, just be sure to visit Daffodil Planter. Thijs, a hobby gardener, writes from Holland about her garden, animals, insects in the garden, and scenic holidays. You'll enjoy the descriptions and beautiful photographs of the garden in different seasons. It's translated into English. This is a fascinating blog, featuring photos and stories about Karen's streetside garden. With better Seattle pictures than Google-Earth, and really inspiring writing - it's a must-click. A farm and gardens blog with a sprinkling of knitting and seasonal ridiculousness, from Terrye in Northern Michigan. TC writes from Northern Pennsylvania about life in and out of the garden. Groovy photographs - from ladybugs to power tools! Marie lives and gardens in a tiny apartment with a tiny terrace in New York. Her blog is great! Beautiful photographs and great stories from an unapologetic geek - and that's a quote! A 'blog cabin' (hee hee) in upstate New York, and the simple life - enjoy! 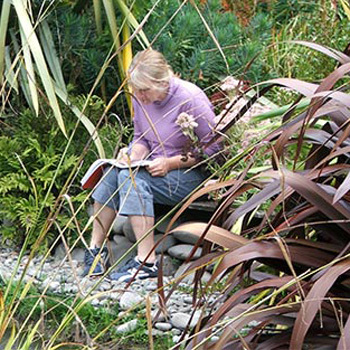 Laura grows California natives, succulents and dry weather plants. Her blog is a goldmine of great information. A real gardener's blog, with pictures of hard work and dandelions as well as the pretty things! A must read.